On December 1, 1864, 150 years ago today, David McM. Gregg’s entire Second Cavalry Division set out to attack Stony Creek Station on the Weldon Railroad. This point was the northern terminus of the railroad since Warren’s Fifth Corps had cut the rest of the railroad north to Petersburg in August. As a result, Stony Creek Station was where Confederate supplies were unloaded from trains and loaded onto wagons for the trip to the Boydton Plank Road and then into Petersburg. It should have been a point which was strongly guarded, but the Confederates simply didn’t have enough men left at this point to do so. Some 150 or so dismounted cavalrymen from various brigades were stationed at Stony Creek, and the troopers of W. H. F. “Rooney” Lee’s Cavalry Division picketed the roads leading there. After two earlier recon missions in November, on the 7th and 28th, involving first a 50 man detachment and the entire 13th Pennsylvania Cavalry, Gregg was asked by Meade and Grant to take his entire division and see whether or not Wade Hampton and a portion of his cavalry had gone south to interfere with Sherman’s March to the Sea. Taking all three of his divisions, Gregg left camp at 4 a. m. on the morning of December 1. He followed the same route taken by the 13th Pennsylvania Cavalry on November 28, with that regiment in the lead of his entire column. The Second Brigade led, followed by the First and Third brigades. The 13th Pennsylvania Cavalry crossed Warwick Swamp at Lee’s Mill, proceeded until they hit the Jerusalem Plank Road, and turned right on the road to Rowanty Creek. They again encountered Confederate pickets at the Dunn house, and again brushed them aside easily. The Confederate reserve, most likely dismounted men or mounted troopers from Rooney Lee’s Division, was stationed at Rowanty Creek. This time, the 13th managed to brush them aside and capture the bridge across the creek. The 3rd Brigade was left at this point to hold what might end up becoming Gregg’s escape route if he ran into trouble. The 13th Pennsylvania finally gave up the lead as another regiment from the Second Brigade moved ahead for the trip to Stony Creek Station. After reaching Duval’s Station, two miles north of Stony Creek on the Weldon Railroad, the First Brigade was detached to watch for Confederates approaching from the northwest, the direction of the main Confederate lines. 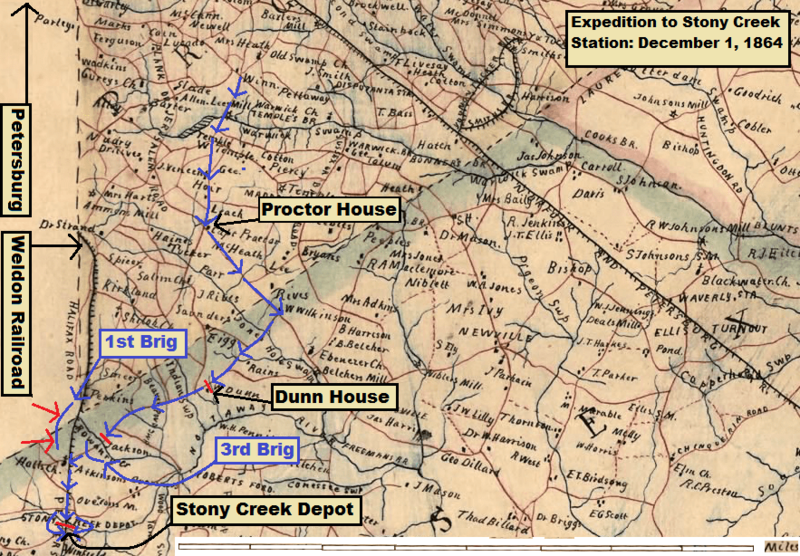 The Second Brigade continued on to Stony Creek Depot, and found Confederate forces holding two separate forts behind Stony Creek. The 4th Pennsylvania Cavalry approached from the southeast mounted, after having found a place to splash across Stony Creek. Meanwhile, the 6th Pennsylvania Cavalry held the attention of the Confederates in front, approaching from the northwest dismounted. As the 6th held the Confederates in place, the mounted men of the 4th surrounded the two forts, causing the surrender of 175 men and two cannon. Among the prisoners were significant numbers of dismounted men from the 4th South Carolina Cavalry and the Jeff Davis Legion of Mississippi. At least a few members of the Holcombe South Carolina Infantry were also present. After this fight, Gregg did what he could to destroy the supplies then located at Stony Creek Depot. The depot itself was burned, along with 3,000 sacks of corn, 500 bales of hay, a locomotive and cars, bacon, Government clothes, ammunition, and various other items. By this time, Gregg received word that the 10th New York Cavalry of the First Brigade was fighting off a Confederate attack to the north at Duval’s Station. Based on the relative proximity of the two Confederate Cavalry divisions in the area, this Confederate force had to have come from Rooney Lee’s Division. Butler’s Division had been building fortifications along Hatcher’s Run and never did reach the area in time to even skirmish with Gregg. As firs the 10th New York Cavalry and later the 1st New Jersey Cavalry held off the Confederates, the Second Brigade and the rest of the First Brigade again recrossed Rowanty Creek. After several final attacks against the 1st New Jersey, the Confederates called off the pursuit and accepted their losses. Everyone from Gregg’s Division was back in their camps by 11 that evening. Gregg’s division lost 4 killed, 38 wounded, and 16 missing in this affair, bringing in 190 prisoners, capturing 2 guns, 8 wagons, and 30 mules.